Danielle Naçu rode her bike to work; it was one of her contributions to her community and her city. Danielle’s family, friends, colleagues and others she’s inspired met downtown on Thursday, October 10, 2013 for the second annual Danielle Naçu Community Bike Ride. 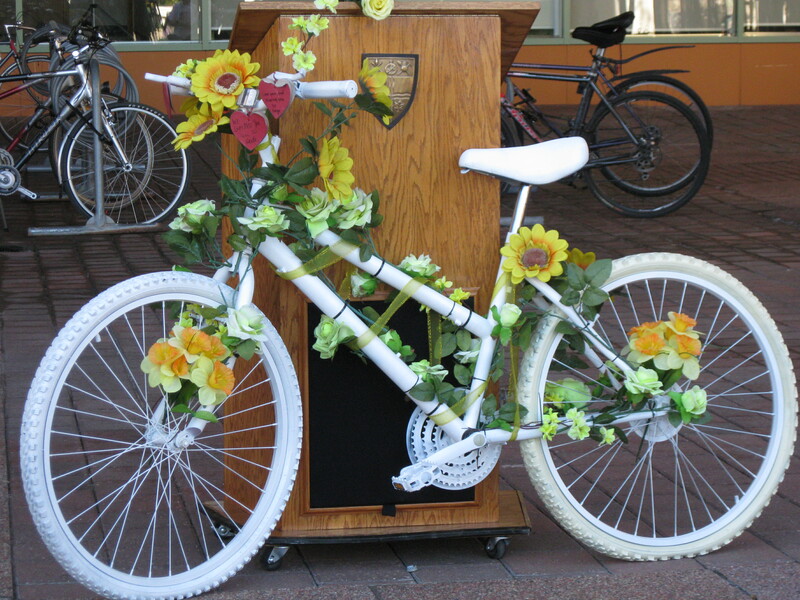 The ride honours the university student, public servant and volunteer, who was killed in traffic while cycling to work in 2011. More than 60 cyclists and pedestrians made their way through downtown from Parliament Hill to City Hall, where representatives of Danielle’s family, co-workers, cycling groups and the city paid tribute to her and to other riders who’ve been killed or injured on Ottawa streets. They also spoke about ways that citizens, cycling groups and the city can make Ottawa safer for cycling. Danielle’s brother, Brent, thanked people for coming out to remember her, adding that those who gathered were the start of a movement that hopefully will enable people, years from now, to know the joy of cycling. Already, through the efforts of family and friends, a scholarship in Danielle’s name has been established at the University of Ottawa, and the family is working with Share The Road and the City of Ottawa to establish a permanent memorial that will serve as a tribute to cycling. Her family is also advocating for legislation to prevent “dooring,” a common and dangerous occurrence when a driver opens a car door from the inside in front of an oncoming cyclist. I didn’t know Danielle, but I’ve been a bike commuter, a student, volunteer and traveller, and the more I learn about her the more I’m impressed at her dedication and community spirit. I’m grateful to her family, who have been able to see through their grief to work for the safety of all Ottawa residents. I’m thankful to have experienced the ride—to be one of dozens of bike riders filling the street was empowering, and it gives a hint of what’s possible if more people are comfortable enough to be out on their bikes. When you’re getting out of your car, always assume there’s a cyclist coming up beside your vehicle. Look first, with a shoulder check and your side mirror, and then open your door very cautiously. When you’re getting out of your car, open your car door with the hand that’s opposite the door. (That means if the door is on your left, open the door with your right hand.) You’ll need to twist to reach the door handle, which prompts you to look behind you before opening the door. If you’re a cyclist: Ride about a metre away from cars parked along the curb. Take the vehicle lane if you have to.